It’s hard to believe the two halves of this composite photo are the same view. The upper half shows what I could see on a relatively clear day. That far range of mountains is the White Tanks, about 55 km (35 miles) distant — as the buzzard flies. The range in front of them is about 16 km (10 miles) from here. The closest range, starting on the far right, is around 8 km (5 miles) away. Those saddle-back hills on the left are only 0.8 km (0.5 miles) from my deck, where I shot both photos. 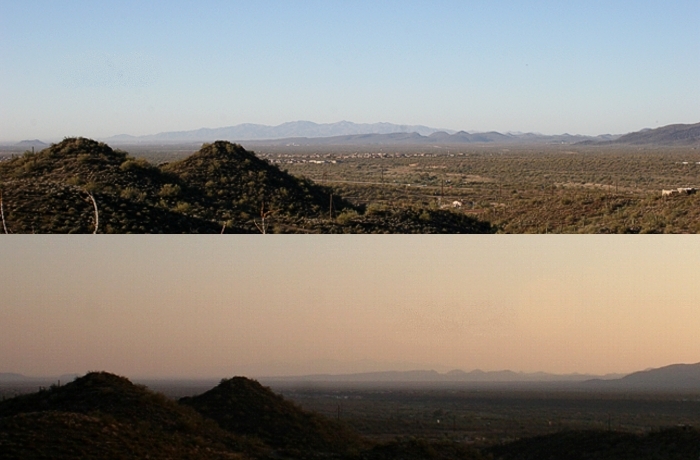 Compare the top half view to the lower half, which was photographed on a hazy day when we had an “air pollution alert.” The air looks “thicker” and discolored, and the White Tank Mountains are just barely visible. This post could have been about air pollution, which is a real problem around Phoenix in the winter months. We often get inversions that trap pollutants near ground level and prevent them from dissipating. In fact, you’re seeing some of that smog in the lower half view. But instead, I decided to talk about atmospheric extinction, an effect that is also well shown in both photos. I’m sure you’ve seen it, even if you didn’t know what it was called. The basic idea is this: Even though we say air, water, and glass are transparent, they are not perfectly so. Put enough air, water, or glass between your eyes and what you’re looking at, and things start to dim out. That’s extinction. Atmospheric extinction is an ominous-sounding term. But it’s a normal effect even on clear days. The more atmosphere light has to travel through, the dimmer and bluer that light becomes. When you look toward the horizon, you will see extinction altering the appearance of distant objects. Don’t confuse this with what happens to colors during sunset, though the cause (scattering of blue light) is the same. The mountain ranges in these photos are covered with essentially the same rocks and foliage, but notice how they become “bluer” the more distant they are (top half photo). That’s because air scatters blue light in all directions. It’s also why our sky is (normally) colored blue. The Blue Ridge Mountains in the US Appalachian range are named for this effect. When you look straight up the effect is still there, but much less pronounced. Air is thicker near the ground, so the lower you look in the sky, the faster atmospheric extinction will degrade your view. The higher you look in the sky, the less air between you and your target. Consider that the shortest path to the vacuum of space is in the vertical direction. The brownish color of the sky in the lower half view is due to smoke and other particulates. The normal level of atmospheric extinction is greatly amplified by these pollutants, which scatter light even more efficiently than does air. That’s why the White Tanks are barely visible in the lower photo. Of course, atmospheric extinction also happens at night. Astronomers prefer to build their telescopes on the summits of high mountains to get above the thickest air. Astronomers also prefer to observe objects that are higher in the sky, and farther from the horizon. Ultimately, that’s the motivation for building and launching space telescopes. Above the Earth’s atmosphere there is no extinction. From that lofty outpost we can get our best views of the cosmos.